Good. 2007. Paperback. Good clean copy with some shelf wear.....We ship daily from our warehouse. Very Good. Consent to Kill by Flynn, Vince. Trade paperback (US). Glued binding. 496 p. Mitch Rapp, 8. Very Good. 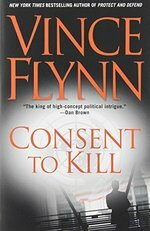 Consent to Kill: A Thriller by Flynn, Vince, 2005-10-11. Glued binding. Paper over boards. With dust jacket. Good. Consent to Kill: A Thriller by Flynn, Vince. Glued binding. Paper over boards. With dust jacket. anything that vince flynn writes is worth the tine to read and enjoy. very suspenseful,. Very entertaining and interesting book. Keeps up the plot and hard to put down.